This week we begin a new four week message series we are calling “Labor in the Lord.” We hear in the writing of Paul, that in the Lord our Labor is never in vain. It may seem what we do for God does not accomplish anything, or we are not convincing people to become a disciple, or perhaps we think when we serve we are not making anything better. But when our labor is done in the name of the Lord there are always benefits. On our own we can do very little, but when we labor in the name of the Lord, God will accomplish much through what we are doing. Over the next four weeks we will look at the Sunday readings and reflect on them in the context of laboring for the Lord. This week, our readings point to a message that the least are made worthy. We may never feel ready, or adequate to be a laborer in the Lord, however God makes us ready. There is nothing God will give us to do that requires more than we are able to accomplish. We will look at how God’s hand uses our weaknesses to advance his plan. 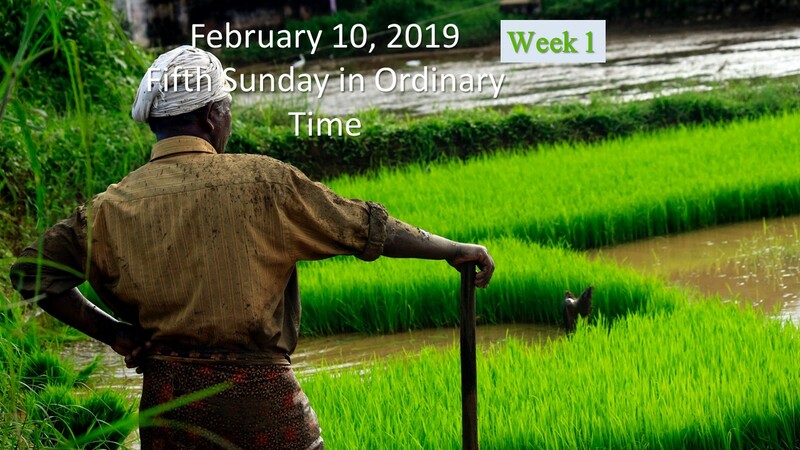 The readings this week are from the Lectionary for the Fifth Sunday in Ordinary Time; Isaiah 6:1-2a, 3-8; Psalms 138:1-2, 2-3, 4-5, 7-8; 1 Corinthians 15:1-11 and Luke 5:1-11. These readings guide us this week to look at worthiness. Often a response in the word of God when God asks for something to be done is, I am not worthy. We think we need to be a special kind of holy person to do the work of God but in fact God calls more on those who are the least to do the most. We look at laboring for the Lord when we are the least. In the second reading from First Corinthians we read Paul’s version of an elevator speech. He tells Christ died, was buried and rose, he appears to his disciples, and others and finally to Paul who refers to himself as one born abnormally. Paul was an unbeliever and convinced that Jesus was dead. But he had a radical change in his life, a new birth as he declares, when Jesus appeared to him. Paul goes on to describe he is the least of all the apostles not fit to be called an apostle because he persecuted the church. But his unworthiness was used by God who gave Paul grace so that he could be an effective laborer for the Lord. Paul goes on to say after this he worked harder than anyone, yet still it was the grace of God that was effective. Paul labored in the Lord and the Lord made great change through Paul’s efforts, an unworthy servant whose labor in the Lord was a great success. In the gospel reading from Luke we see the call of Simon to be an apostle of Jesus. They had met prior and in this scene Jesus is using Simon’s (to be renamed Peter the rock) boat to preach to the crowds. After he finished speaking Jesus had Simon cast his net out again even though Simon had fished all night without a catch. Peter’s obedience let him see a miracle of a catch. Simon then confesses his sinfulness to Jesus. Jesus encourages Simon (and his partners who have seen the entire event, James and John) from this moment to be a follower. With Jesus’ encouragement Simon and the others followed Jesus and became fishers of men. We see another example of someone declaring their unworthiness before Jesus, and receiving grace from God to be a laborer in the ministry of Jesus. Simon became Peter and dies for the labor of the Lord made worthy through grace. The Lord needs laborers and we have seen in these readings examples of God calling laborers to ministry. Isaiah, Paul and Peter never believe they were worthy to become a laborer of the Lord, to speak to leaders and others equally, to call any who would listen to follow the path of God. It doesn’t appear any of them have any particular background to be a minister for Jesus, in fact each might believe they are the least, but God takes their unworthiness, their lack of skills and most importantly their willingness to serve and transform their labor into great change. The least are made worthy. Each of us are called, hopefully we are unworthy as well, and hopefully we think we are the least. When God calls the least and makes them worthy the most is accomplished. If we confess our unworthiness and willingness to serve, God’s grace can make our labor for the Lord very profound. The stories we read from the scriptures are filled with those who don’t seem worthy and make an appeal to God for help. God’s response turns their unworthiness to a great labor that advances the mission of God. We see many woman of the bible who were barren and pray to God for children. We have Sarah and Abraham having a miracle son Isaac who became patriarch of the Jewish nation, whose son Jacob’s twelve sons become the twelve tribes of Israel. We also see Isaac was unworthy and a sinner when we read he lied to the Philistines telling them his wife Rebekah was his sister to save his own life. We see the least made worthy. The Hebrew nation itself was not a powerful worthy people but would be made worthy as the chosen of Yahweh. They were slaves in Egypt when God sends for and frees them from their slavery. They were an unworthy nation that God constantly depended upon to set the stage for future messages and setting the pathway for the Messiah. The least nation made worthy. The mother of Sampson was a woman barren when an angel appears to inform her she would conceive a son. Sampson was a warrior that would deliver the Israelites from the hands of the Philistines. She was told how to eat and teach her son that would influence him, she was the least made worthy with God. Hannah prayed for a child, promising him to the temple if God grants her prayer. Samuel was born of Hannah and was a great prophet who God used to confront the nation and to select the first Kings the nation begged God to provide for them. But even Hannah herself became the model for a future mother, Mary, who understood Hannah’s prayer and turning it into the Magnifcat with Mary’s saying. The least made worthy. We have Elizabeth who was barren in her old age praying God would give her a child and God answers. She gives birth to one of the most powerful prophets of all time, John the Baptist who proclaimed the coming of the Lamb of God. Even Mary the mother of Jesus was an uneducated Jewish girl who didn’t know how to do anything but say yes unequivocally. The least made worthy. We can look at some men in the scripture stories, Moses the great leader of Israel was a murderer and not allowed to enter the Promise Land because of his disobedience. David was an adulterer and murderer who was the great King of Israel and patriarch to the line of the Messiah. We see the prophet Jeremiah hesitates when called by God, Job is an unjust sufferer and Jonah ran the other way when called by God. God takes the least and makes them worthy and then depends on their labor for a great task. God relies completely on the least. It is through knowing our own vulnerability, which reveals our powerlessness and therefore trustworthiness to become an instrument in God’s plan. It is the powerless one that God gives power. God doesn’t give power to anyone except people who know they are powerless. God realizes that the discovery of powerlessness is learned through a painful journey of transformation. It is the unworthy who realize their weaknesses, sin and confess. It is the transformed God can trust with the power he makes available. God’s dependency has been on the rejected, the outsider, the one who knows their own weakness, unworthiness and with the exception of Mary, the sinner. God knows because of this awareness they can be trusted with power. It is the unworthy who knows they are not doing anything on their own. They know to leave everything up to God, they don’t need to protect themselves. The unworthy, those who depend on God know they don’t have to be great and powerful because God protects them. The transformed trust they are not doing anything alone, that God’s thoughts are their thoughts and they let all control go to God. There is a great message when the Israelites were escaping from Egypt and reached the Red Sea. They were frightened and cried out to God, thinking the wilderness will be their burial place as Pharaoh’s Army approached meaning certain death. Moses tells them do not fear, stand their ground and then says, “The LORD will fight for you; you have only to keep still.” (Exodus 14:14) This is the message of God, sit still and let me take care of everything. We know God split the sea and they lived. You are not worthy, you are the least, but God makes you worthy. God needs our labor. God depends on us to fulfill his plan. It is through our unworthiness, and confession of our weakness, our sin that we are transformed and a powerful instrument in the hands of God. Trust in your unworthiness, you will be made worthy by God. Let all your labor be for the Lord. No matter what you do, if you dedicate it to the Lord, it will be a labor that God can use to transform others, to help his message of love be spread. In our labor God will find connections with others who can see our labor and be inspired to do their own labor in the Lord. Never underestimate what God can and will do with your labor once you dedicate it to Him. You are made worthy by God and your labor is not in vain when you devote it to God.